The Northeastern hockey team ended the first half of the season with a big win over Michigan State as part of the ‘Winter Showdown’ weekend, and over the final two months of the season the Huskies received verbal commitments from three junior hockey players. In addition, multiple recruits signed their National Letter of Intent (NLI), committing themselves officially to joining the Huntington Hounds next season. The first commitment was in November from Brandon Schultz, a ’96 F playing for the Waterloo Blackhawks in the United States Hockey League. Schultz clocks in at 5’8” and 165 pounds, clearly on the smaller side for a forward. His stat line reflects his play making tendencies, as he currently has a 4-14-18 line in 24 games for Waterloo, to go along with 26 penalty minutes. Previously, Schultz played for the Janesville Jets of the North American Hockey League, where he broke out in 2014-15, tallying 28 goals and 30 assists for 58 points in 56 games. That season led Schultz to be selected in Phase II of the USHL draft by Waterloo, who cited his junior hockey experience with a winning club as an attractive feature. The second commitment came from a local product, John Picking out of the Junior Bruins program in the United States Premier Hockey League. Picking, a 5’10”, 170 pound ’95 birth year from nearby Wellesley, Massachusetts, is having the best season of his juniors career as an ‘over-ager’ (older than the average age of the league’s players), coming in at 13-25-38 in 24 games. He has been in the Junior Bruins system his whole career, dating back to their U16 team beginning in 2010-11. Picking was a part of the Junior Bruins Tier III National Championship during the 2013-14 season. The final commitment will be a large presence on the team even if he does not skate in a single game: Curtis Frye, a ’95, 6’4” goalie out of the Philadelphia Flyers Elite program in the same USPHL that Picking hails from. Another ‘over-ager’, Frye currently sits on a 3.14 goals against average and a .908 save percentage, a year after posting a 2.96 GAA and .914 SV% in the same league, however Frye only played 16 games, a mark he has already eclipsed as 2016 begins. Frye is no stranger to the junior hockey circuit- he was named to the 2012-13 US National Team Development Program, playing for the U17 team and was chosen for the U18 team, but a tear of his meniscus caused him to miss the entire season. Hockey East players Thatcher Demko (BC), Steve Santini (BC), Scott Savage (BC), Tyler Kelleher (UNH) and Shane Eiserman (UNH) were all a part of that U18 team. After the US team, Frye played for the PAL Junior Islanders and New Jersey Hitmen in the USPHL before finding a home in Philadelphia. Frye has long been in the eyes of scouts. The Goalie Guild offered this scouting report on Frye in 2013, praising his recovery from his knee injury. Parts of their scouting report include: “Quality athleticism for his 6’4” frame, he fills the net extremely well. Tracks well on his skates,” and “does a good job of getting into an athletic crouch before dropping to make a save. He has good posture for a bigger goalie and does not appear too hunched over, which helps maintain good upright balance.” Brian Daccord, head of Stop It Goaltending, praised Frye on and off the ice for his “Ivy-League caliber grades” and his “combination of size and athleticism.” Frye was also called the best goalie USHR saw at the 2014 Road to College Showcase at Babson College, and has attended camp with the Baie-Comeau Drakkar of the QMJHL in 2015, though he left early to preserve his NCAA eligibility. Frye will enroll with Picking for the 2016-17 season. In addition to securing verbal commitments, multiple Northeastern recruits finalized their commitment to Jim Madigan’s program for next season. Forward recruits Bobby Hampton and Grant Jozafek, in addition to defenseman Ryan Shea and Jeremy Davies, have all signed their allegiance to the red and black for next season. These high-profile recruits promise to have an immediate impact when they reach Matthews Arena. With only 5 current Huskies slated to graduate, playing time will be at premium next season, barring any unforeseen early departures. Mike Davis is the leader of the Northeastern hockey student section known as “The Doghouse.” He will be a contributor to WRBB Sports throughout the coming season. You can follow Mike on Twitter at @spellinwithmike. Northeastern secured a verbal commitment from one of the top players in the New Jersey High School circuit last season. Bobby Hampton, a late ’97 from Middletown, NJ, pledged his allegiance to the Huskies on September 27th. A right-handed shot, Hampton clocks in at five-foot eleven inches and 174 pounds, already a good sized player up front. He played 28 games with the Jersey Hitmen U18 team in the USPHL last year, posting a 6-17-23 line, but the numbers that really standout are from his high school season. After playing his first two seasons of high school hockey for Christian Brothers Academy, Hampton chose to transfer to Middletown North High School for his junior season. Transfer rules limited Hampton to only 16 regular season games, but he set the ice ablaze with his play during that time, racking up 35 goals and 19 assists for a grand total of 54 points, or 3.38 points per game. He continued his high level of play in the state tournament, tallying 16 points in five state tournament games, including two goals and two assists in the title game. After leading his team in goals and to the state title in the process, Hampton was crowned the 2014-15 All-Shore Hockey Player of the Year in New Jersey. Mike Davis: Congratulations on your commitment! 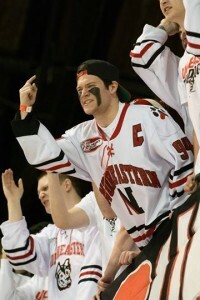 NU is a top notch school and a hockey program on the rise. What appealed to you about NU as a school and as a program? Who was your main recruiter at NU? Bobby Hampton: NU is such an attraction to me because my family and I love the Boston area and NU plays in the best college conference in the country, so when deciding it was no question for me. Coach Jerry Keefe was my main recruiter during the process, and I toured the campus with both Coach Madigan and Coach Keefe. MD: What are your plans for the upcoming season? Where will you be playing and what role do you expect to fill? BH: For this upcoming season I will be playing for the U18 North Jersey Avalanche with some hopeful games in the USHL. MD: What other schools were your considering other than NU? What was the whole process like for you? BH: Other schools I was considering were St. Lawrence and Holy Cross. The process was a lot of fun, I went on a bunch of visits to different schools like Penn State, Providence, Quinnipiac. But NU is a dream come true. MD: How would you describe yourself as a player? BH: As a player I would list myself as a big power forward with the capability to make plays and see the ice well, and I can finish when opportunities are given. MD: When will you be enrolling at NU? BH: I am not positive when I will be a freshman at NU but I think it will be the year after next if I am physically ready for college hockey. Hampton was a 2014 4th Round pick of the USHL’s Madison Capitals in the 2014 Futures Draft, so we can look forward to him playing in the competitive USHL, and can expect him to flourish there if his track record is any indication. He is projected for 2017 but it is possible he gets pushed to 2018 depending, as he said, on his development. Congratulations to Bobby and his family. Follow us on Twitter and Instagram @NUDogHouse for up-to-date information for the upcoming season. Go Huskies! Jerry Keefe, Jim Madigan, Jason Smith, and the Northeastern Men’s Hockey program continued their momentum on the recruiting trail, picking up verbal commitments from two regional defensemen in the last three weeks. ’98 right shot defender Collin Murphy committed on September 22nd for the 2017-18 season, and ’99 RD Julian Kislin committed on October 3rd for the 2018-19 season. Murphy is a local kid from Wilmington, MA, and played his last two seasons at Austin Prep High School in Reading, MA, posting a line of 3-9-12 in 43 games played. Austin Prep has produced a bevy of hockey talent, including Bobo Carpenter (freshman at Boston University), Elijah Harris (standout goalie committed to Brown), and Tom Fitzgerald (former NHL’er and father to two current Boston College players). Already standing at six-foot two inches and weighing in at 185 pounds, Murphy projects to be a shut-down defenseman who can control gaps well and lay the body onto opposing forwards. According to Jeff Cox of SB Nation, Murphy has a good reach with his stick, and is tough to beat one-on-one. Cox also reports that Murphy had multiple others offers from Hockey East, ECAC, and Ivy League schools. Kislin comes to Northeastern out of New Jersey, where he has played with Team Comcast 16U and the New Jersey Jr Titans 16U teams the last two seasons, posting a composite scoring line of 6-20-26, although most of that was with Team Comcast. Kislin is another tall player standing at six-foot two and weighing in at 170 pounds. A raw, right shot defenseman, he gained notoriety thanks to an assist he had on a play in which he did a spin-o-rama around an opponent, deked around a second, and dished a pass through a third’s legs to set up a goal. The play was featured on SportsCenter‘s Top 10. Kislin is eligible for the 2017 NHL Draft, and will be a prospect that bears watching as he develops his play and hones his craft over the next few seasons. Follow us on Twitter and Instagram @NUDogHouse and for up-to-date information for the upcoming season, and our SnapChat @NU_DogHouse for behind-the-scenes looks at NU Hockey and the DogHouse. Go Huskies! Jim Madigan secured a verbal commitment from one of the top uncommitted forwards in New England after ’99 F Matt DeMelis announced he has chosen to play college hockey at Northeastern. DeMelis is a rising junior at Hingham (MA) High School, where he recently won an MIAA Division 1 State Championship as a sophomore, and was also on the Boston Herald All-Scholastic Team. DeMelis was chosen in the seventh round of the 2015 USHL Futures Draft by the Cedar Rapids Roughriders, the team that both incoming freshman Adam Gaudette and recruit Matt Filipe are affiliated with. A six-foot tall, left-shot forward, DeMelis produced a scoring line of 17-26-46 in 27 games for Hingham High. Jeff Cox of SB Nation: College Hockey has watched DeMelis extensively while scouting local talent, and had the following to say about his play: “He has a very strong, long stride, but skates a little hunched over. He does a good job keeping the puck on his stick and is a possession-type forward. He has good hands and vision, can weave in and out of traffic, and he can create time and space because of his lateral mobility and stick-handling ability. He had interest from several Hockey East schools.” DeMelis ultimately chose Northeastern over national champion Providence College. DeMelis will play this upcoming season for the Boston Advantage AAA Midget Team this upcoming season. Congratulations to Matt and his family! You can follow Matt on Twitter at @MattDeMelis. Follow us on Twitter and Instagram @NUDoghouse for the most up-to-date information about NU hockey this season. Over the weekend the Huskies secured a verbal commitment from ’98 F Matt Thomson out of Reading (MA) High School. Thomson is a 6-foot, 180-pound left-shot center who led Reading in scoring as a sophomore this past season, with a line of 13-9-22, after going 3-3-6 as a freshman. In his freshman campaign, Thomson was a member of the Reading team that defeated Braintree to win the Massachusetts Interscholastic Athletic Association Division 1 State championship. Mike Davis: What appealed to you about NU as a school and as a program? Who was your main recruiter at NU? Matt Thomson: “Northeastern is a great hockey school and always has been, and it has evolved into an extremely successful academic school, and being a Boston kid it’s just that much more special to me to attend Northeastern. My main recruiter was Coach Jerry Keefe, who is a great coach and an even better guy”. MD: What are your plans for the upcoming season? MD: What other schools were you considering other than NU? What was the whole process like for you? Congratulations to Matt and his family on his commitment. You can follow Matt on Twitter at @Matt_Thomson8. Follow us on Twitter and Instagram at @NUDogHouse and for up-to-date information for the upcoming season.